Apparently Hodor is universal. Imgur user Seiji has re-imagined iconic moments from George R.R. Martin’s fantasy series/Hobbesian hellscape Game Of Thrones as Japanese woodblock prints. There are six in all, depicting events through the second novel, A Clash of Kings; for the spoiler-conscious, only three of them involve murder. The artist also added fascinating notes about how he adapted each scene, from the explaining the equivalent medieval weaponry to giving Weirwood trees touches of Shintoism. Somehow, Joffrey looks like even more of a tool in a traditional nobleman’s eboshi cap. 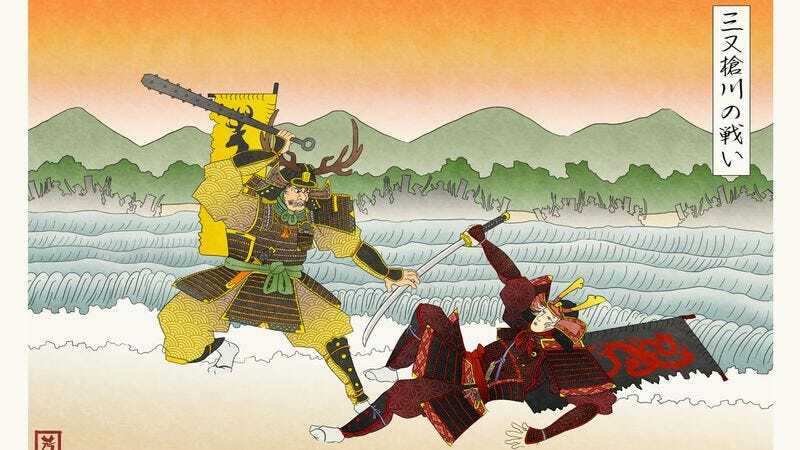 The grim power struggles for Westeros translate beautifully to the bold lines of Edo-period artwork. Unfortunately for fans of the HBO series, though, in these images, the Mother Of Dragons is fully clothed.